Following Rookie Camp at City National Arena and the trade of Nick Suzuki, we’ve updated our prospect rankings. As always, the full rankings can be found using our navigation bar under the “Prospects” tab. Or, click this. Brannstrom attended his first rookie camp and did not disappoint. He was easily the best player on the ice in all three rookie games and showed the much more responsible defensive game needed to have a shot to play in the NHL this year. AHL Coach Rocky Thompson (who was coaching the rookie games) specifically called him “a future top two defenseman.” In the immediate future, he’ll be heading to full training camp to try and earn a spot on the Golden Knights roster this season. With Nate Schmidt out for 20 games, he’s got a real shot. 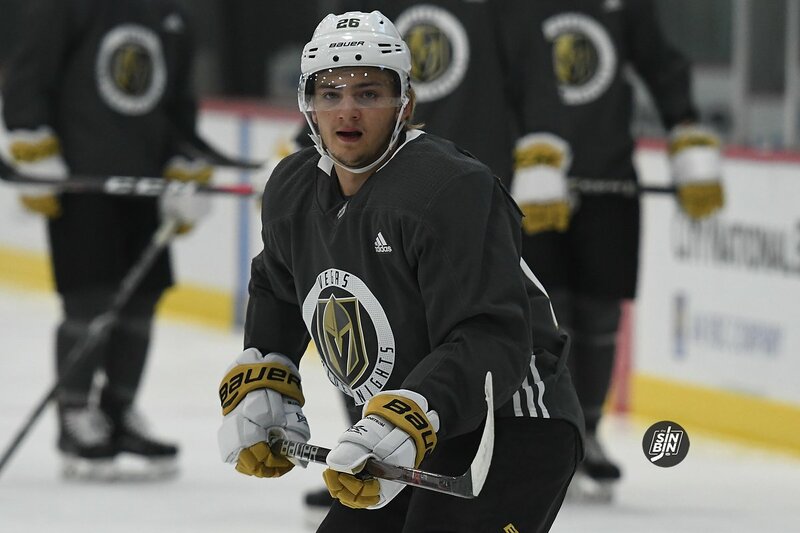 7/28/18 – The diminutive Swedish defenseman almost has an aura around him when he steps on the ice. Much like a home-run hitter in baseball, there’s a feeling that every time he touches the puck something special is about to happen. He has great vision and an incredibly high confidence level that leads to breathtaking stretch passes. He’s also a very good skater which helps him overcome his small stature. Moving forward he has to work on controlling mistakes. Due to his unwavering belief that he can make something happen with the puck, he tends to turn it over or get caught out of position quite frequently, much more than a reliable NHL defenseman should. 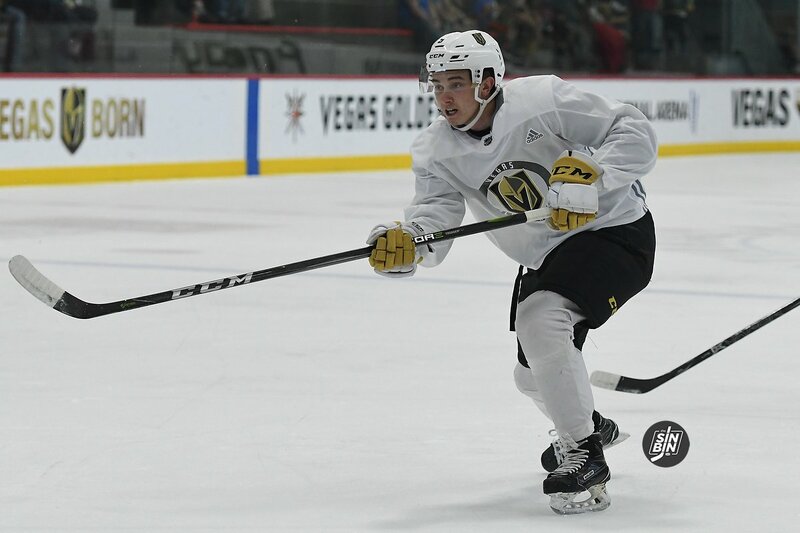 Brannstrom has a legitimate shot of making the Golden Knights roster out of camp, but with his waiver exempt status and a bit of a logjam of NHL-level defenseman, he’ll more than likely end up in the AHL to start the year. Hague had a great trio of games at City National Arena. Not only did he score a number of power-play goals, but he also proved he’s a heck of a leader. Coaches and players couldn’t stop raving about how much impact he had on others during camp. He still looks like he’s not quite ready for the NHL, but it’s starting to feel safer and safer that he’ll be an NHLer. When it happens, he’s going to give Colin Miller a run for his money for heaviest shot on the team. 7/28/18 – Since slipping out of the 1st round, Hague has seemed to play with a chip on his shoulder, going out and winning the Max Kaminsky Trophy for the OHL’s Most Outstanding Defenseman. Hague is a giant on the ice standing 6’6″ tall and weighing over 215 pounds. He also has a laser beam of a shot that he unleashes when he’s able to join the attack or on the power play. His greatest defensive skill is his reach, but his skating still holds him back a bit from being a completely reliable defenseman. Hague will almost certainly head to the AHL this season where he may get a chance to make his NHL debut at some point during the year. As the #6 overall pick in the 2017 Draft, Glass was expected to be a top-six type forward. He still may eventually become that, but his performances in the rookie games made him look like he’s more likely headed for a role as third center. He makes a lot of little plays on both ends that impress, but he doesn’t quite show the flair that a top-end guy should playing against other 19-year-olds. Read the rest of the prospect rankings here.